Our agency takes its name from the wonderful City of Melbourne. Located almost in its centre, we are only about ten minutes by tram from the City Centre, or about twenty minutes by foot, past one of the most beautiful of Melbourne's many parks, and past the World Heritage listed Exhibition Buildings. It is not easy to quickly describe why Melbourne is such a wonderful city in which to live and work, especially for travelling nurses or interstate visitors who have never visited before. Melbourne is safe, clean, friendly, and with a relatively low cost of living. But more importantly, we can describe some special aspects of nursing in Melbourne, and provide a guide to a range of helpful information and useful links. As always we are only too happy to assist our members and visitors with any aspect of their stay. Nursing in Melbourne offers a great variety of opportunities for travelling nurses or those interested in either extended or permanent placement. Every conceivable nursing speciality is available in a range of public, private and community based health care organisations. The working conditions in the health care facilities are of a high standard. Newly established patient-nurse ratios of 4:1 have been adopted in public hospitals allowing nurses to take time necessary to provide quality care. Many of the major hospitals and aged care facilities in Melbourne have adopted a "no lift policy" to reduce risk of injury to nursing staff who are constantly required to move and reposition patients. The purchase of lifting devices and aids along with assistance of orderlies to move heavy patients and the provision of education programs for nursing staff in the use of this equipment is aimed at reducing the high rate of back injury among nurses. Along with Vancouver, Vienna, and Geneva, Melbourne has regularly been rated as one of the most liveable cities in the world. Some details and summary survey results are presented by the Committee of Melbourne on their informative site. In their words, "Melbourne is safe, clean and friendly, with a very low cost of living", but that is far from all. Melbourne's easy and relaxed lifestyle can be experienced and enjoyed both within Melbourne and outside Melbourne according to one's mood or interest. For experiences and activities within Melbourne we can only give a few hints of things that we enjoy. Some of our favorite activities include shopping at Victoria Market on Saturday morning, strolling the parks on sunny days, visiting the theatre, or experimenting with new restaurants in the restaurant district. And like all Melbournians we always enjoys excellent coffee at an outdoor cafe. Other suggestions may be found on the Visit Melbourne and Visit Victoria websites. Outside Melbourne there are very many different things to see and do, from day trips to extended holidays. 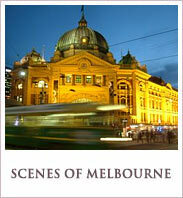 Many of our members use Melbourne as a base from which to explore further afield. Depending on the season, visitors may enjoy skiing at Mt Buller; or else if they are wine buffs, they may tour the many excellent wineries of the Yarra Valley. The Great Ocean Road is always a favourite, as is the Fairy Penguin Parade at Philip Island every evening at dusk. Other suggestions may be found on the Visit Melbourne and Visit Victoria websites.